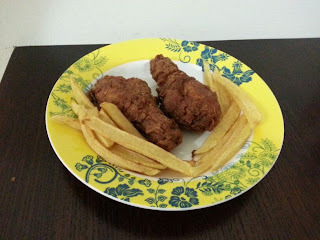 I came across this recipe for fried chicken and instantly decided to give it a try due to the name Al Baik tagged to it. Al Baik is a fast food chain similar to KFC in Saudi Arabia. The broast chicken meal is very famous and tastes out of this world. The recipe turned out quite good and we enjoyed it. Best eaten hot as it is crisp and the outer crust turns soft as it cools down. Chicken pieces - 500gms with or without skin. I used drumsticks. 1. Wash chicken well and pat dry with kitchen towels. Prick all over with fork. 2. Marinade it with all the ingredients specified above, cover and refrigerate it for minimum 4 hours. 3. In a zip lock bag or plastic bag, add the all purpose flour, salt and chilli powder and mix well. 4. Put the chicken pieces one by one in the plastic bag and shake well to make the flour coat well on the chicken piece. 5. Heat oil for deep frying and once hot reduce the flame to low. 6. Deep fry the chicken pieces without over crowding on low heat by turning them a few times till it is golden brown and crispy. 7. Drain on kitchen towel. Enjoy Fried chicken with french fries and garlic sauce.